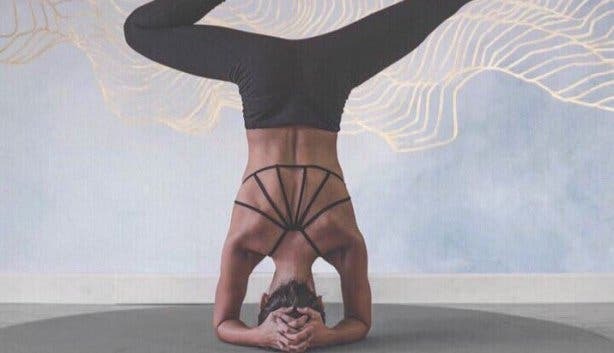 Yoga is the art of stretching, breathing and connecting the physical form with the spiritual form. Practices of the ancient exercise date back thousands of years. 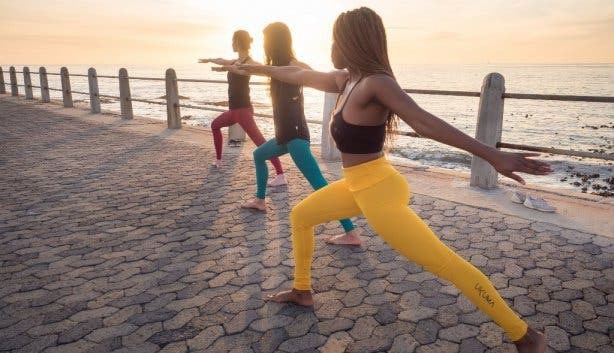 The Mother City boasts numerous world-class yoga studios and if you’re a newbie looking to join the world of yogis or an established yoga guru looking for a new place to unroll your mat, we’re certain our list of Cape Town’s top yoga studios will have something to offer you. Happy stretching and Namaste! 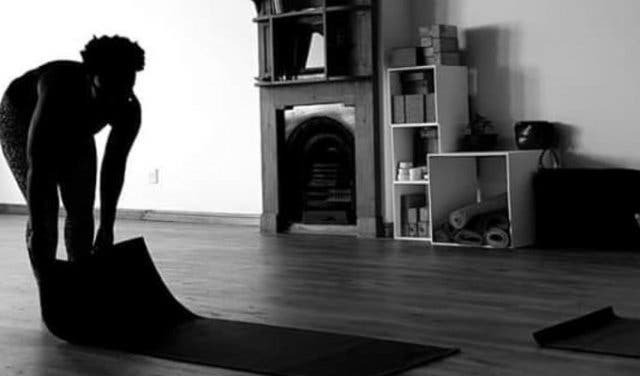 Holding Space is a new yoga studio with a difference in Woodstock. Situated just outside the city bowl on Victoria Road. Holding Space is what yoga instructor, Kafui Awoonor, calls “the first black-owned and run yoga studio in Cape Town”. And that’s important to her, because, as some might know, Kafui was very vocal recently around making yoga more outwardly open and inviting to all Capetonians. Different types of yoga and wellbeing practices are available. From vinyasa, hatha and kundalini to movement therapy. You can also look forward to sound journey experiences, womens’ circles and monthly new moon or full moon gatherings. Read more about Holding Space Cape Town. (They're very well priced however still ask them if they have specials for CapeTownMagazine.com readers at present). 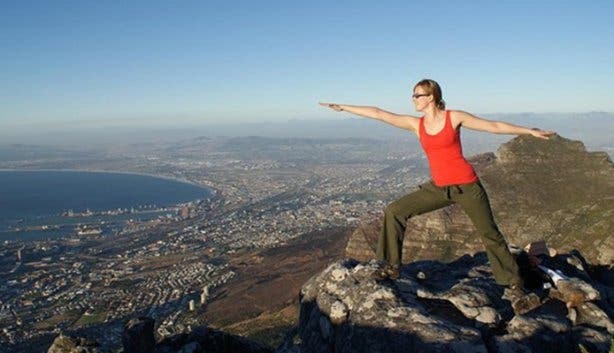 Opening its doors in 2014 as Cape Towns first mobile yoga service, The Om Revolution is now under new ownership. Husband and wife team Joe and Hayley Speakman continue to bring a fresh perspective and energy to yoga for all walks of life. With a focus on taking yoga to the people, they offer a range of services designed to suit your yoga needs. These include the very popular outdoor classes, held in the summer months of Nov–April (R70pp or R50pp when bought as a block of four classes). As of January 2019, outdoor classes cost only R50. All the more reason to kickstart your health in the new year! Private yoga experiences in your chosen location (R1100 for groups of up to 10 and R1600 for groups up to 20, including mat rental). You can even take yoga to the office with the popular corporate yoga programmes. Contact them for more information and read more about The Om Revolution and their weekly yoga schedule. 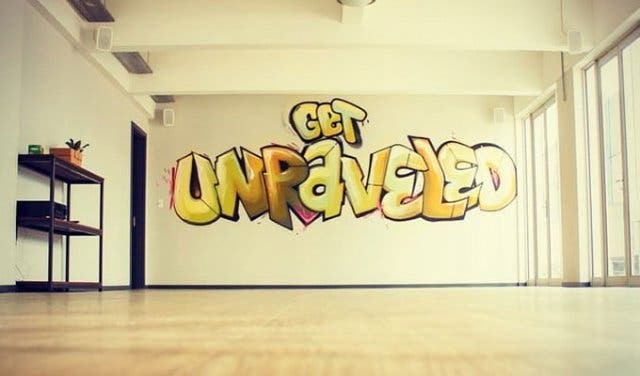 This inner city yoga getaway is edgy, young, fun and unique. 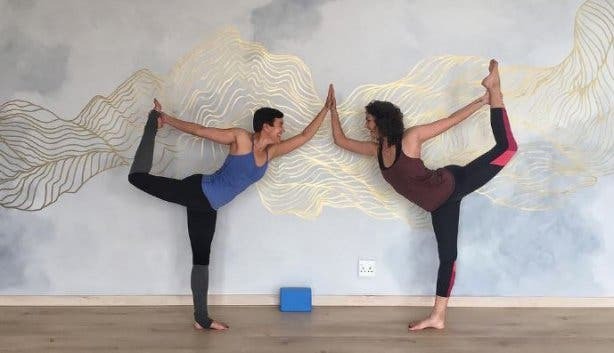 Located on the ever popular Bree Street, this yoga studio is a little different when it comes to the traditional interior design you’d expect from a yoga studio. The walls are covered in stunning graffiti murals done by Cape Town’s own Falko One. It is fully equipped with all the bells and whistles and you can bring your own mat and towel or rent theirs for just R40. They offer classes that range from absolute beginner to seasoned professional. They specialise in vinyasa with an unraveled twist, which means they teach vinyasa flow accompanied by sweet beats. With a relaxed studio, happy vibes and healthy atmosphere, Yo Yoga is sure to give you all the inner-peace and tranquillity you need. It is a space where you can be yourself while unwinding, exercising your body and relaxing your mind. Yo Yoga offers Bikram, Yo Bikram, Ashtanga, Vinyasa flow yoga and much more to get you into serenity. Their aim is to help you improve both your physical and mental wellbeing through the regular practice of yoga. Hot Dog Yoga Studios has two yoga rooms – one used for hot yoga and the other at regular temperature for Vinyasa, Iyengar, kids and pregnancy yoga training. The studio offers a range of experienced and inspiring trainers who teach yoga to all interested souls. The ReUnion Yoga and Meditation studio is open to everyone. They offer a wide range of yoga asana classes and meditation. It is here where you can reconnect, refocus and replenish your reserves under the guidance of experienced yoga teachers. This is also the only studio that teaches moon sequence as well as beginner classes which focus on synergy and meditation. The yoga classes are kept deliberately small to ensure a low teacher-to-student ratio, which in turn gives you a high-quality class and the best possible practice. 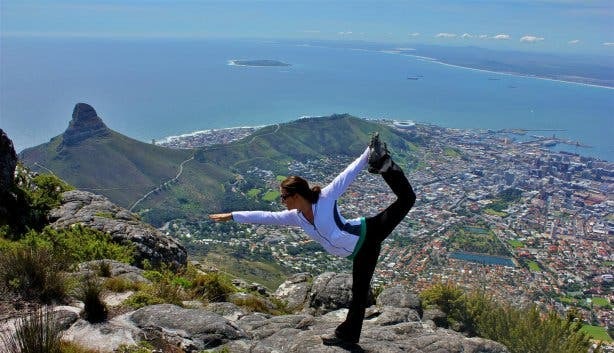 Focussing on Vinyasa and Power Yoga, Dave Porter's addition to Cape Town's bendy scene offers 'yoga for everyone'. With love, dedication and a good sense of humour your teachers will help you to find your appropriate level and there are even free classes for beginners. With the double-storey lodging literally on the beach, it comes as no surprise that African Soul Surfer boasts Cape Town’s only sea-facing yoga studio. What’s more zen than looking out onto the calming ocean while perfecting your breathing and poses, right? The backpackers hosts yoga classes seven days a week and drop-in classed range from R80p/p - R100p/p, and R600p/p - R750p/p for a 10-class card. Of course, if you want to contrast the calming effects of yoga with an adrenaline rush, the vibrant hostel integrates surf culture into its look and also offers surf lessons and as well as board and wetsuit hire. 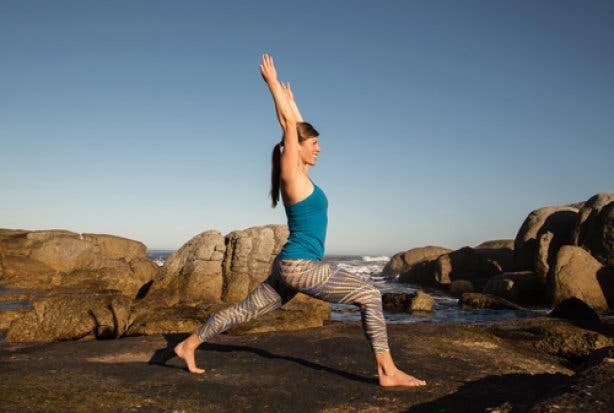 This studio specialises in Ashtanga yoga taught by Krishnamacharya and Sri K. Breathing exercises and meditation are top of the curriculum and international yoga trainers regularly visit the studio in Cape Town to share their wisdom. They are conveniently located on Roeland Street for those of you who live in the city and are looking for something accessible and close by. Their onsite shop will satisfy all your yoga needs and they also offer workshops. Find your inner voice and the perfect balance between inner and outer beauty with guidance from the GuruRamDas Yoga Studio. Kundalini, Ashtanga, Vinyasa, as well as dance and meditation are practised here as well as yoga instructor training courses. Explore yoga with the help of experienced and dedicated teachers in a bright studio with wooden floors. Each yoga class has a maximum of fourteen participants in order to guarantee individual attention. After the course, you can have some food and enjoy a refreshing drink in the Cook Shop, or treat yourself to a massage. The studio offers courses for beginners, teacher training, synergy courses and workshops. Want to know more about Cape Town? The Mother City is fast developing so to keep you clued up; we’ve rounded up some of the hottest latest additions to Cape Town in our New Restaurants and Hot Spots overview. Discover it. 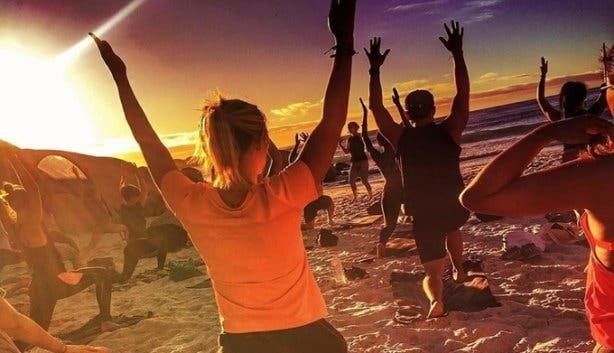 Perfect your oms by the ocean with this yoga session by the sea. Have you ever done yoga in an inflatable heated igloo? 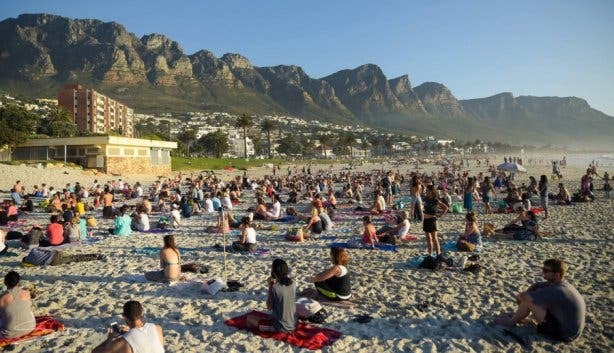 The first Cape Town Hotpod Yoga has arrived in Salt River. Find out more about Hotpod Yoga. Combine your love for yoga and dogs at the Downward Facing Adopt a Dog event.